It's not often these days that two Michael Douglas movies come along at the same time, however his character in Beyond The Reach couldn't be further from the inventor / superhero mentor he plays in Ant-Man. Set in the Mojave desert, this survival thriller offers up it's fair share of entertainment in it's cat-and-mouse style tale of murder and deception but sells itself short when it comes to a fully plausible plot. 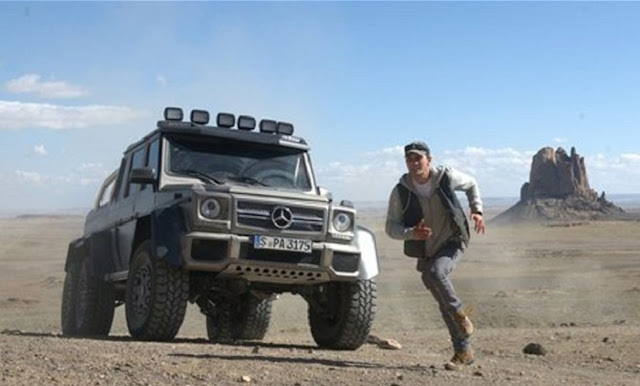 Young tracker Ben is going through something of a crisis in his personal life when a wealthy insurance broker, Madec arrives in town with an array of expensive weaponry and a set of flashy wheels. Madec is keen to be be shown around the harsh landscape that borders the town, wanting to hunt some big game while closing a deal. It isn't long before Madec lands the pair of them into some serious trouble and decides that Ben, rather than him, will be the fall guy. The searing heat of the Mojave provides the perfect backdrop for an intense thriller, but ultimately the movie is let down by a narrative which becomes less and less plausible as Ben is forced into ever more dangerous confrontations with his murderous employer. While the twists and turns make for entertaining viewing, by the time the finale has rolled around it has descended into the absurd, making it hard to take any of it seriously. Jeremy Irvine gives a competent performance as Ben, and watching his character adapt to the worsening conditions of the desert and cheat death while being hunted is half the fun of the movie, but ultimately it's Douglas' character that steals the show. Displaying almost Bond-villain levels of ingenuity to satisfy his homicidal tendencies and to put Ben in the frame for their crime, he is simply marvelous to watch and the encounters between the pair are compelling and entertaining. Director Jean-Baptiste Leonetti attempts to tread the fine line between intense and gritty thriller with a morality tale and commentary about the abuse of power and privilege, and ends up falling short on both counts, though not without crafting a polished looking movie and getting the best from his actors. What begins as a suspenseful thriller is let down by an ever-worsening script that drains the sense of realism from the movie and a terrible ending that feels stapled on for the benefit of audience satisfaction but is completely unnecessary. Beyond The Reach, at it's best, is taut and gripping, interspersed with bursts of solid action, but unfortunately while aiming high, this thriller is as much miss as hit.